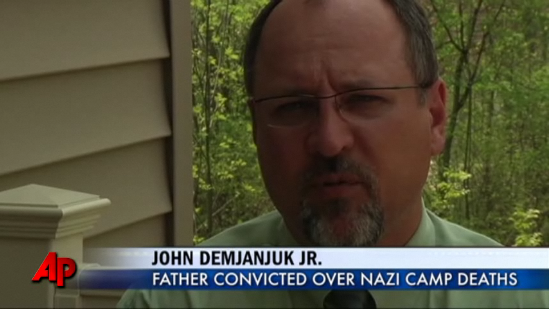 A court in Germany has found John Demjanjuk guilty of helping kill nearly 28,000 Jews in a Nazi concentration camp. Earlier in the day Demjanjuk rejected an offer to make a final plea as 18-month trial came to a close. Asked by judges whether he wanted to say any final words, Ukrainian-born Demjanjuk, speaking through an interpreter, replied: “No”. There was no evidence that Demjanjuk committed a specific crime. The prosecution was based on the theory that if Demjanjuk was at the camp, he was a participant in the killing — the first time such a legal argument has been made in German courts. Thomas Walther, who led the investigation that prompted Germany to prosecute Demjanjuk, said before the verdict that other low-ranking Nazi helpers could now face prosecution. The newly declassified FBI field office report, obtained by The Associated Press, casts doubt on the authenticity of a Nazi ID card that is the key piece of evidence in allegations that Demjanjuk served as a guard at the Sobibor death camp in occupied Poland. The FBI agents argued that the Soviets had an interest in faking the documents as part of a campaign to smear anti-communist emigres. Those conclusions contradict the findings of another branch of the Department of Justice, the Office of Special Investigations, or OSI, which was in charge of the overall Demjanjuk probe. It is unclear whether prosecutors in the U.S. and Israel knew about it. The defense has argued throughout the trial that the ID card is a clever fake, noting that Demjanjuk’s height and eye color don’t match and alleging there are indications the photograph was taken from old identity papers and glued to the card. The OSI in the past has been accused of withholding evidence that could have cleared Demjanjuk. The FBI report accuses the Soviets of anonymously feeding names of emigres to the United States as suspected Nazis. The OSI would then ask the Soviet Union for evidence from captured Nazi records, and “the KGB produces a record purporting to tie the accused with the commission of Nazi atrocities,” it said. “In court, the KGB officer thereupon ‘shows’ the documents to the judge but does not permit the documents to be presented in evidence or to be otherwise copied,” it adds. Demjanjuk was accused of working for six months at the Sobibor extermination camp in occupied Poland in 1943, during which time 27,900 Jews were gassed to death there. Demjanjuk served nearly eight years in an Israeli prison, five of them on death row after being found guilty in the 1980s of serving as a guard in another death camp – Treblinka – where he went by the name “Ivan the Terrible”. A German court has ordered John Demjanjuk released pending an appeal of his conviction as an accessory to murder at a Nazi death camp. Presiding Judge Ralph Alt made the announcement as he wrapped up his verdict Thursday in the 91-year-old’s trial. It could take six months or more for an appeal verdict to come. The Wisenthal Centre which has been behind all of Demjanjuk’s prosecution failed to convict him as Ivan The Terrible in Treblinka in the 1980’s. During that trail the Centre was already preparing for this Sobibor case, and if the appeal comes through, the next stop in this witch hunt is already planned in Spain for Flossenburg.